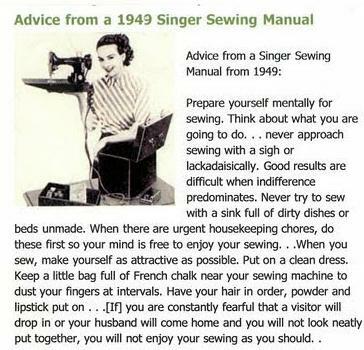 Every now and then I see the "Advice from a Singer manual" pop up in my social media feeds and have a good old chuckle....but then I thought that it's not overly relevant for today's seamstress/seamster so I've had a crack at re-inventing it! When you sew, make yourself as attractive as possible. Go through a beauty ritual of orderliness. Have on a clean dress. Be sure your hands are clean, finger nails smooth — a nail file and pumice will help. Always avoid hangnails. Keep a little bag full of French chalk near your sewing machine where you can pick it up and dust your fingers at intervals. This not only absorbs the moisture on your fingers, but helps to keep your work clean. Have your hair in order, powder and lipstick put on with care. Looking attractive is a very important part of sewing, because if you are making something for yourself, you will try it on at intervals in front of your mirror, and you can hope for better results when you look your best. 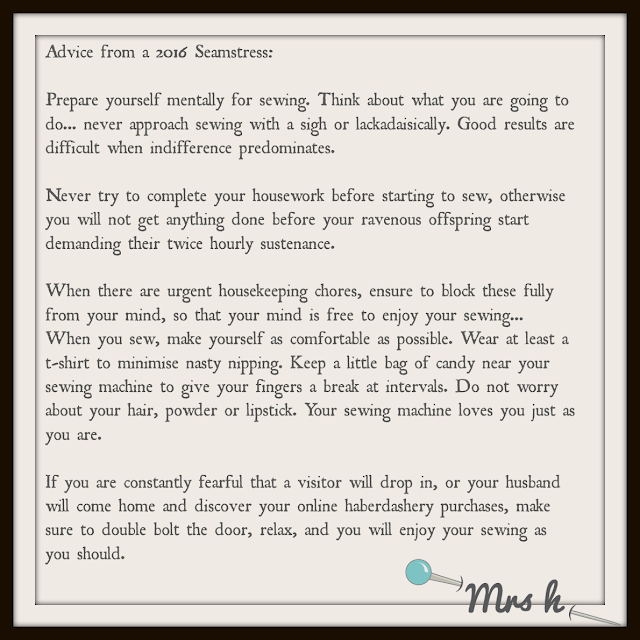 If you are constantly fearful that a visitor will drop in or your husband will come home and you will not look neatly put together, you will not enjoy your sewing as you should." If you want to read more about the original book from Snopes, the hoax slayers, you can find the article here. 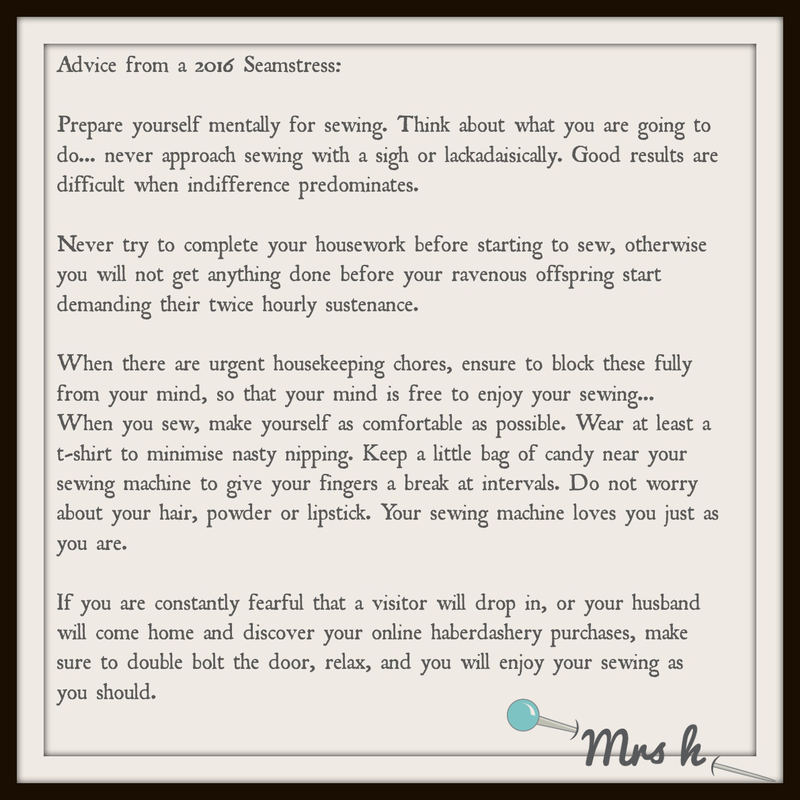 Prepare yourself mentally for sewing. Think about what you are going to do... never approach sewing with a sigh or lackadaisically. Good results are difficult when indifference predominates. Never try to complete your housework before starting to sew, otherwise you will not get anything done before your ravenous offspring start demanding their twice hourly sustenance. When there are urgent housekeeping chores, ensure to block these fully from your mind, so that your mind is free to enjoy your sewing... When you sew, make yourself as comfortable as possible. Wear at least a t shirt to minimise nasty nipping. Keep a little bag of candy near your sewing machine to give your fingers a break at intervals. Do not worry about your hair, powder or lipstick. Your sewing machine loves you just as you are. If you are constantly fearful that a visitor will drop in, or your husband will come home and discover your online haberdashery purchases, make sure to double bolt the door, relax, and you will enjoy your sewing as you should. What do you think, does it reflect the more modern approach to sewing?